Most people are well familiar with the term “generic” when it comes to medications, a term referring to any drug marketed under its chemical name without all the fancy packaging and advertising. We know that by law, for a medication to be labeled as “generic” for a name branded prescription, it must be chemically identical to its branded cousin. 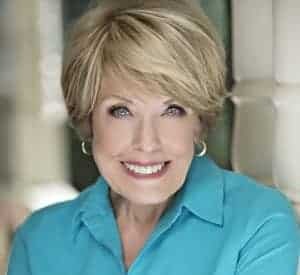 Today I want to offer you cheap generic alternatives for these three popular cleaning products—Bar Keepers Friend, Super Washing Soda, and OxiClean. It’s been years since I learned about oxalic acid. Sounds scary, doesn’t it? Like something in the chemistry lab that could blow any second. Relax. It’s not what you might think. In fact, if you look on the back of a can of one of my favorite cleaners, Bar Keepers Friend, you’ll read: Contains oxalic acid. That miraculous product, Bar Keepers Friend, which costs about $5.50 for a 12-ounce can is nothing more than generic oxalic acid. Are you familiar with Zud, another household and garage cleaner? It too contains oxalic acid. The minute I learned this generic fact, I went online and ordered a 2-pound bag of oxalic acid for about $15 (price varies) and marked Bar Keepers Friend off my shopping list forever. I keep my oxalic acid in a well-marked little bucket that has a tight-fitting lid. 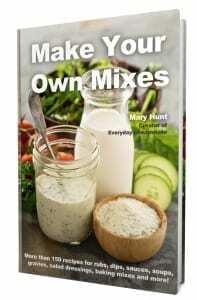 I use a standard pint-size mason jar with a shaker lid as a dispenser and use it most sparingly while wearing gloves, keeping in mind that it is highly concentrated! Mixing oxalic acid for household use is simple and takes just a few moments to complete. The strength of the oxalic mixture depends on the cleaning and bleaching needs of the project. Step 1. Mix three parts oxalic acid crystals with one part warm water to create an oxalic acid paste. The paste can be used on wood with dark stains created by watermarks. This paste can also be used as a spot treatment but should not be used to cover an entire surface. Work on a small area at a time. Step 2. Apply the paste to the stained areas with a paintbrush and allow to dry. Step 3. Remove the oxalic acid paste with a wet sponge. Thoroughly clean or discard the sponge after removing the oxalic acid paste. Step 1. Create an oxalic acid wash to bleach larger sections of wood that do not require the deep bleaching the oxalic paste creates. For small areas mix 1 ounce of oxalic acid with one-cup warm water. For larger areas mix 8 ounces of oxalic acid crystals with one-quart warm water. Step 2. Apply the wash to the wood surface using a sponge. The wash will bleach the surface of the wood evenly. It is important to cover all areas of the wood to achieve the desired result. Be certain to get the wash in trim pieces and into corner pieces. Step 3. Remove oxalic acid wash with a clean sponge and clean water. 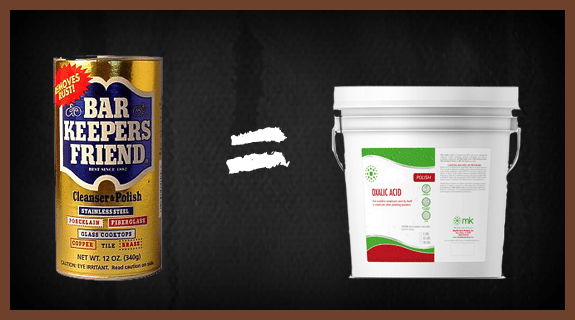 Caution: Keep in mind that a bag of oxalic acid is 100% oxalic acid, while Bar Keepers Friend contains oxalic acid (plus inert fillers). You can use much less oxalic acid to get a great response than the amount of BKF you might use to accomplish the same result. And please make sure you always wear gloves when using either BKF or oxalic acid! It looks and feels for all the world like laundry detergent. White. Coarse. Powdery. A mineral mined from vegetation in dry lake bottoms in the Middle East, kelp from Scotland and seaweed from Spain, it’s used to make glass, bricks, paper, rayon, and toothpaste. It cleans silver and softens water. 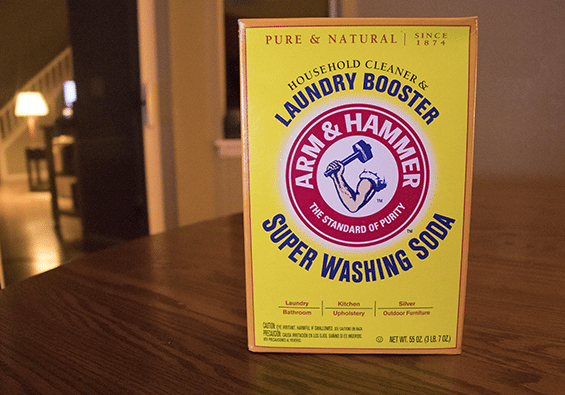 Its real name is sodium carbonate, but this stuff also goes by soda ash, Na2CO3, and good old Arm and Hammer Super Washing Soda. Washing soda and I go way back. For years, I have added washing soda to the washer for cleaner, whiter, brighter laundry. More recently, it has become one of the ingredients in our homemade laundry detergent. Best of all, washing soda (aka sodium carbonate) is cheap. Depending on the source, expect to pay around $.10 per ounce. More recently, I am discovering that washing soda is much more than a laundry detergent booster. With a powerful pH of 11, washing soda acts as a solvent all around the house, garage. Sodium carbonate removes dirt, grime, greasy build-up and a range of stains.